There are many reasons for the breath to be free while riding. One is that you stay connected to your parasympathic nervous system - that is where calm lives - so not only will you stay in a good place emotionally, but your horse will sense this and stay calm too. Another is that breathing keeps your body mobile, as soon as you hold your breath you lock up. 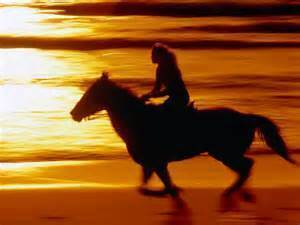 So to flow with your horse requires that the breath be free. Yet what often happens is that riders hold their breath or have their breath locked in to movement, not independent of movement. Unmounted: Exploring your breath while moving. 1) Sitting in a flat chair with no arms, notice how you breathe. 2) Shift your weight right and left a few times and notice how you do this, notice where your head goes, and notice how you breathe. As you do this, allow your lower abdominals to expand as you inhale, and empty as you exhale, and notice how this feels. Notice the correlation between your breath and your movement, is it a 1:1 relationship, i.e., every time you shift your weight right you are in the same place of the breathing cycle? For every breath, shift right and left a few times. 4) Shift your weight right and left a few times and notice how you do this, notice where your head goes, and notice how you breathe. Is it easier now to separate your breath from your movement? Mounted: Exploring your breath in relationship to movement while at a walk, trot or canter. 3) Allow your lower abdominals to expand as you inhale, and empty as you exhale, and notice how this feels. 4) Notice the correlation between your breath and your movement, is it a 1:1 relationship, i.e., every time your right hip opens are you in the same place of the breathing cycle? 5) For every breath, allow the horse to open and close each hip a few times. 7) As you continue straight along the rail, allow your lower abdominals to expand as you inhale, and empty as you exhale, and notice how this feels. 8) Notice the correlation between your breath and your movement, is it a 1:1 relationship, i.e., every time your left hip opens are you in the same place of the breathing cycle? 9) For every breath, allow the horse to open and close each hip a few times. Breathing freely is the heart and soul of riding comfortably and confidently so spending time to improve and integrate it into your riding is time well-spent. Enjoy!